I’ve previously blogged about my love of Mustangs. For a brief time, I had a Mustang – a pretty 2005 V6 that I put a lot of money into in order to bring her back to life. 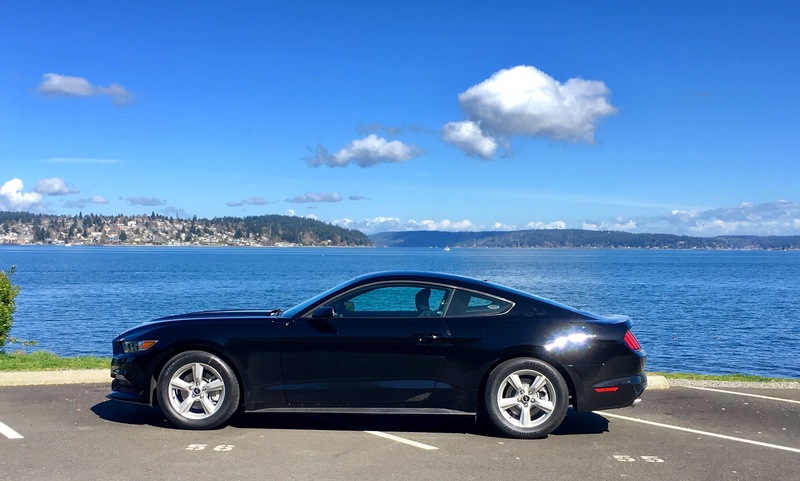 Then we moved to the Seattle metro area, where traffic was a gnarly, terrifying beast that the Mustang, with 130k miles on it and a lot of quirks, was ill suited to handle. I transitioned to a Fiat 500 and I loved it, but… let’s face it, a Fiat is not a Mustang. I’ve figured out Seattle’s traffic and, since we live on the peninsula, I don’t drive into the city that much. Ferries, Uber/Lyft, and my company’s shuttles get me where I need to be. Planning so many spring and summer adventures in this car! I have a new obsession. Steve Martin and Edie Brickell’s Bright Star, which is currently running on Broadway. I’m a lifelong lover of bluegrass thanks to my dad, and I got to see Steve, Edie, and Steep Canyon Rangers in concert a few years ago in Indianapolis. It was ahhhhhh-mazing. I’d heard a few snippets of the music from the show, but the cast was on the Today show this past week and performed one of the songs from the show. I am now 1000000% hooked and can’t wait for the original cast recording to be released this Friday, 4/29. I haven’t been this gaga over a musical since RENT. I’m also planning a quick in-and-out trip to NYC so that I can see this show! I HAVE TO SEE THIS SHOW! Learn more about this gorgeous show here, and listen to the cast recording here! Music owns me. Nothing lets me lose myself like a powerful song. As a writer, I can often envision entire scenes in my head between my characters just because of a melody or refrain. Music soothes my soul or revs me up or inspires me or becomes a companion when I need it. Simply put, I love music. I’m sitting on the floor of my hotel room. The sliding glass door is wide open, the air swooping through the room, carrying with it the sounds and smells of the city I love. The sun is sinking away now, taking the blue sky with it and leaving soft, burnished beauty in its wake. There is an occasional call of a seagull as it careens between the skyscrapers before heading back out to Elliott Bay. Air brakes hiss. Music thumps. The air smells like food – Chinese, Thai, Mexican – sweet and spicy, but with a hint of salt. I love tattoos. I got my first tattoo when I was 20. My sister took me to a tattoo place in the Highlands neighborhood of Louisville and my tat was done by this biker dude with a long beard who couldn’t stop laughing at me because I hyperventilated and nearly passed out from the pain. When it was done, approximately 4 minutes later, I had a tiny (1 inch tall) tattoo of a yellow daisy on my outside left ankle. My 20-year-old self loved that tat. I felt like a badass. My sister, of course, spent the next decade commenting about my “mole” that looked like a flower because it was so small. Fangirl Corner: have I ever introduced you to my celebrity boyfriends? I like to believe that, as a writer, it is my duty to notice and appreciate attractive men. After all, I can study what makes them tick and what makes them stand out and then allow them to find their way into the fictitious worlds I weave. I am also an admitted fangirl, and when I love something, I love it hard. Completely and thoroughly. I don’t do anything halfway. Put up or shut up is my motto. Go hard or go home. This attitude and way of living life means that, in the case of my many celebrity boyfriends, I love them dearly. So let me introduce you to the men in my life. I don’t have a green thumb. My thumb is as black as they come, which is highly awkward for someone dabbling in herbalism as I am. But I love plants, and I love terrariums. I bought one from Twig Terrariums (chronicled here) and paid a pretty penny for it since it had teeny tiny customized characters in it. And I loved it dearly, right up until the moment I murdered it due to overwatering and general stupidity when it comes to terrarium maintenance.